This printer has been discontinued. The recommended replacement printer is the CIM Sunlight Saturn. 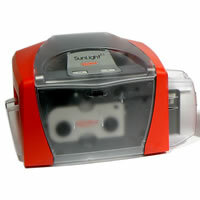 The CIM Sunlight K3 ID card printer is known for simplicity. The Sunlight K3 is designed for small organizations who want to personalize their own ID badges. A combination of the best CIM has to offer, the Sunlight K3 is easy to install with a few clicks. When needed, load your cards and ribbon and you are ready to print. A routine cleaning will provide optimal performance for years to come.